Happy hues-day, friends! 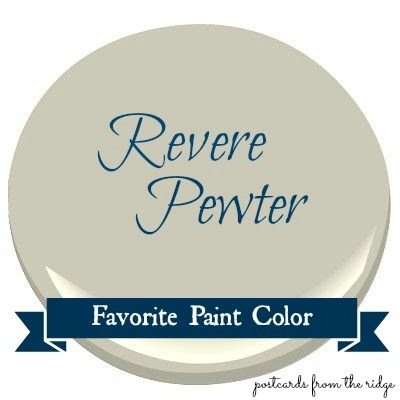 Welcome to week 3 of my new series about my favorite paint colors where Revere Pewter is the featured color. 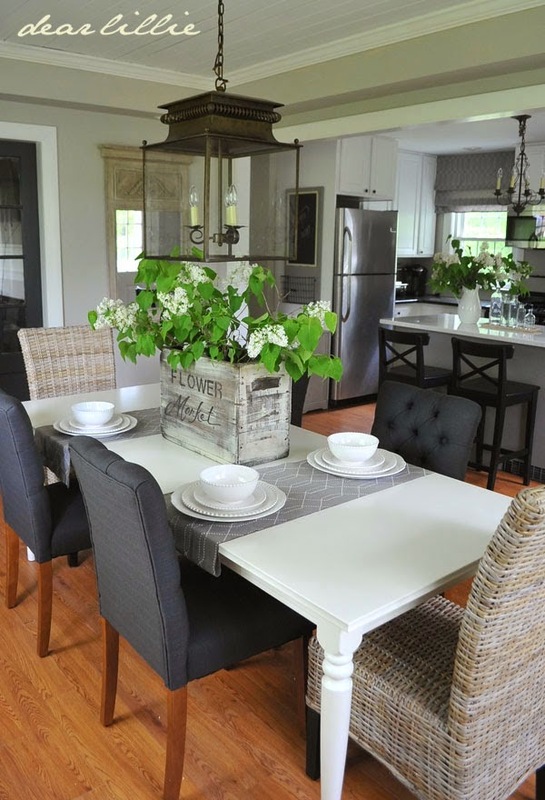 Revere Pewter is the most searched color on the Benjamin Moore website, and for good reason. Revere Pewter is a light gray with warm undertones and a neutral color that works equally well on walls, ceilings, and trim from room to room. It's been called the "perfect whole house color" and is ideal for an open floor plan. It's dark enough that it contrasts nicely with whites and off-whites, but not so dramatic that it competes with bold colors. It can ground and balance a room with colorful décor, or create a serene vibe when paired with pale hues and other neutrals. Here's a beautiful example of Revere Pewter from Dear Lillie. I looks beautiful with the hardwood floors and the pops of black and dark gray. It plays well with other colors of all ranges, including the warm tomato red on the large star as well as the charcoal gray on the sign above. It's the perfect backdrop for the strong colors in this open room. And don't you love the chalkboard-painted re-purposed shutters on the wall behind the desk?? In this classic bathroom it provides a clean and calm atmosphere. You could use any color towels or accessories in this room. The design elements are not overshadowed by the subtle wall color in this gorgeous foyer. Instead of noticing the paint, it's serves as a lovely backdrop for the door, light fixture, molding, and staircase. Jenny at evolution of style painted her living room walls with Revere Pewter and it looks amazing with her floor, furniture, and that gorgeous ceiling. Have you used Revere Pewter before? If so, what did you think of it? 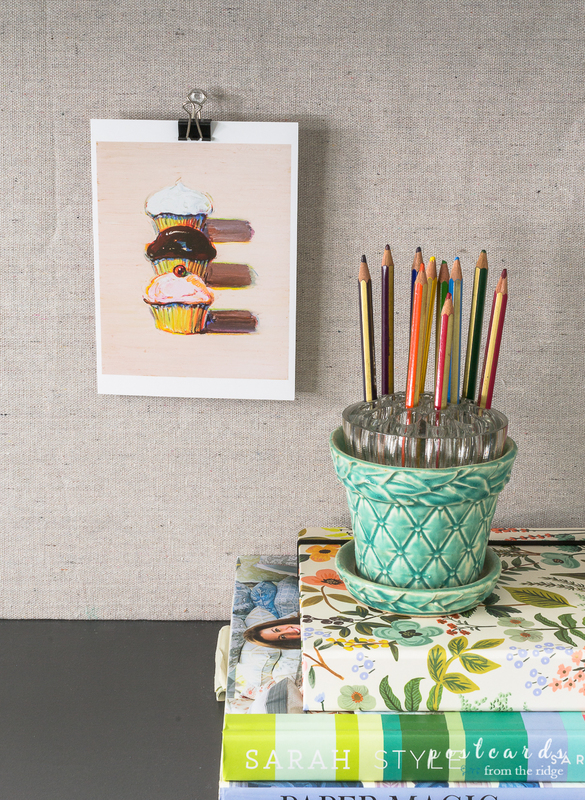 As with any paint color, you should try a sample on the wall, or at the very least get an actual swatch of it before painting with it. Computer monitors all vary in color and simply don't provide a completely accurate version of the true color. 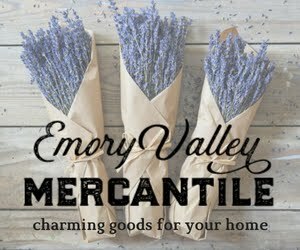 For dozens of other great paint color ideas plus tips for choosing them, visit all of my favorite paint color posts HERE. 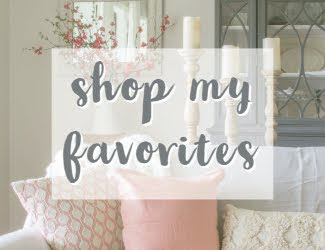 You picked another favorite of mine! I love Revere Pewter and loved seeing it in some of your inspiration rooms. 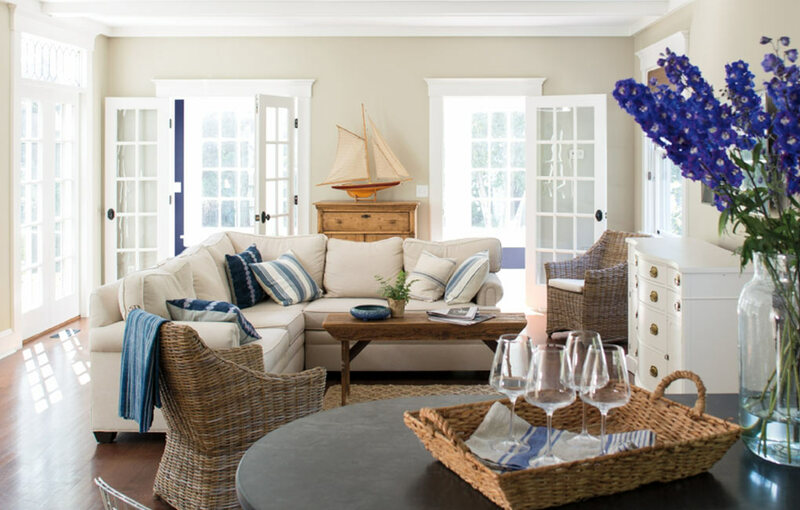 I am planning to paint our family room that color in a few weeks. It was fun to see it work well with some of the red shades. Thanks for sharing Angie! I love it too, Holly! I can't wait to see how yours turns out. Thanks for dropping by! I have it in my whole house. It is very neutral and goes great with white trim and black accents. It is serene and calming. LOVE THIS COLOR! Actually, painting my living room RP this weekend. I researched for hours the perfect gray. Think this is is. 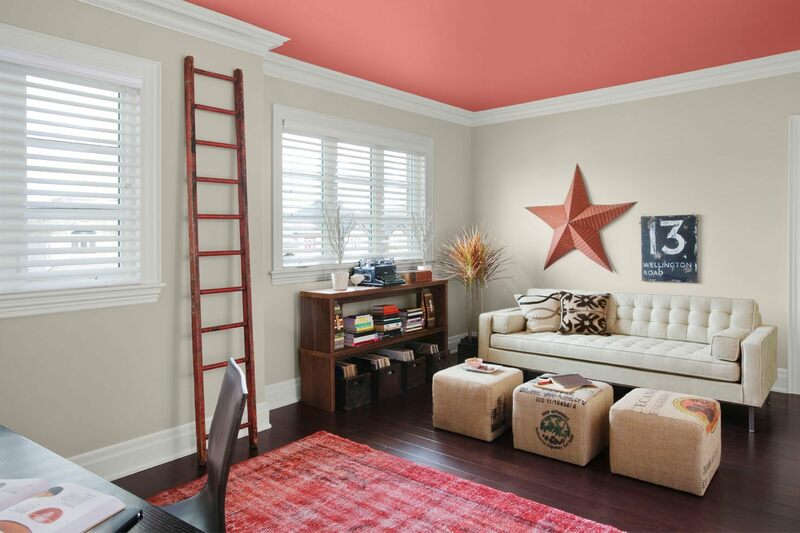 Also chose Ben Moore Georgetown Pink Beige to complement, for adjoining kitchen & hallway. I bought a sample of this & I am not seeing gray in it at all. To me it looks more like the shimmer color of pearls. I have Revere Pewter in my laundry room. I love it, it is VERY warm and leans towards the brown side in there. I spent tons of money fussing over the gray I wanted in my master bathroom (after I finish remodeling it) and finally I decided that I would see how it looked in there and VOILA! It appears the exact shade of gray I was looking for in the lighting in there. LOL isn't it funny how the same color can look totally different in different rooms? I'm seriously considering Revere Pewter for my open floor plan, but I'm stumped if it would clash with my dining room choice, which is a strong blue. Angie, thanks so much! I have been searching high and low for the perfect warm grey...not too dark but not too light. Little did I know that opening this email would be an unexpected lovely gift! Thank you for serving others but sharing your time and talent. When we sold our last home two years ago I let the new owner bring a painter in to repaint the house and she used Revere Pewter. I was apprehensive, but really liked it---enough to use it to paint the new house we built. I am in the process of removing the brick red accents and heading in the direction of navy for accents. I love the way Revere Pewter takes on different hues in each room with the light.